If achieve 10800 steps within one hour can? Serious? The person tell u it cost $11 this year? Last year was $30. Can confirm $11? I gonna prepare to buy liao if i go down HPB they say cannot exchange. Does the HPB steps tracker have any warranty validity? All HPB issued steps trackers will have a warranty period of 12 months from collection date. excessive abuse or misuse and damage arising from failure to follow instructions relating to product use. detachable straps and strap pins are also not covered within the warranty. What do I do if my HPB steps tracker becomes faulty? exchange of their faulty steps trackers at the authorised service providers’ outlets. Alternatively, you can visit National Steps Challenge™ Customer Care Centre located at HPB. encouraged to bring the full steps tracker packaging in case required. assistance to pair your new steps tracker to your profile. dont get skytech one i happy liao. see the picture sibei big. even careaarch one also seems big. but is the smallest with mova one liao. Congratulations for completing 960km in National Steps Challenge™ Season 2. You are now a Completer! Welcome to the exclusive Completer’s journey. It’s time to celebrate your achievement of unlocking all 6 tiers of sure-win rewards. Completers have clocked at least 960km based on the conversion 1,250 steps = 1 km. 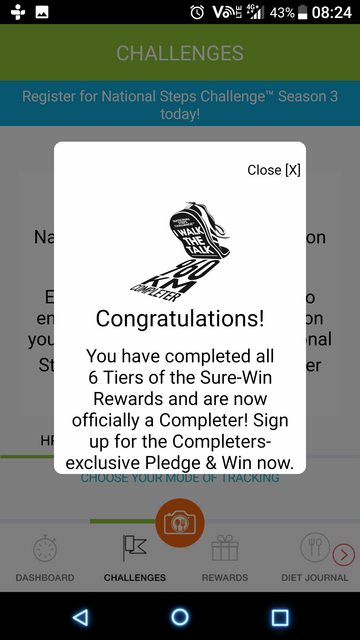 Completers have unlocked all 6 tiers of sure-win rewards and will no longer be eligible for sure-win rewards in National Steps Challenge™. *Completer’s Kit is only available for National Steps Challenge™ participants who have unlocked all 6 tier of sure-win rewards in National Steps Challenge™ Season 2. You can also stand to win attractive prizes with your brand new steps tracker at our roadshow! Can't make it for the roadshows? You can also collect your exclusive Completer's Kit* from 30 Oct '17 onwards at HPB Level 1 Lobby, 12 noon to 8pm too. Currently using Mi Band 2 and Mi Max 2 but yet to download Health365 app yet. Or I need to go and queue up to collect the free HPB tracker? Sweeeeeee! If last year Season 2 got redeem all 6 Tiers rewards is can get Completer's Kit. Means i dont have to spend $ buy the new step tracker since my Season 2 one is spoilt. Mi Band not supported. Only Fitbit, Actxa and dunno what. Go and collect the free one. me... going to wwp there to collect, maybe around 28/29..
i pledged for the 120days of 10k steps/day for the vouchers..
Free one can't choose correct? As in they will only pass me a fixed model? I'm only more concern about the accuracy of the tracker only lol. Ya, u cannot choose, collect what is given to u. Accuracy not as good as Mi Band. Somemore Mi Band is waterproof, this is not. To be honest, ppl use this freebie as watch and to redeem vouchers that's it. ya.. i dun think got new prizes.. the other prizes so lousy.. only using groceries vouchers more often..
was contemplating 90 days of 12k steps or 120 days of 10k... after few days of testing.. 10k is more achieveable..
currently is using healthkit but detected device is my iPhone.. the mi fit app wasn't providing to vitality and hpb app..
u can take the tracker only and put in ur pocket to get the steps.. the season 1 tracker low batt life so i change to amazfit youth as watch and tracker..
Last edited by viperay; 06-10-2017 at 11:05 AM..